Durable data medium: Any means that enables the consumer or entrepreneur to store information addressed to him personally in a way that allows future consultation and unchanged reproduction of the stored information Makes. These general terms and conditions apply to any offer by the trader and to any distance contract concluded between the trader and the consumer. Before the distance contract is concluded, the text of these general terms and conditions shall be made available to the consumer. If this is not reasonably possible, before the distance contract is concluded, it will be indicated that the general terms and conditions are to be seen by the trader and they are sent at the request of the consumer free of charge as soon as possible. If the distance contract is concluded electronically, notwithstanding the previous paragraph and before the distance contract is concluded, the text of these general terms and conditions may be made available to the consumer by electronic means In such a way that it can be easily stored by the consumer on a durable data medium. If this is not reasonably possible, before the distance contract is concluded, it will be indicated where the general terms and conditions can be taken by electronic means and that, at the request of the consumer, they may be notified by electronic means or otherwise be sent free of charge. In the event that, in addition to these general conditions, specific product or service conditions apply, the second and third paragraphs shall apply mutatis mutandis and the consumer may, in the event of conflicting terms and conditions, always The applicable provision which is most favourable to him. If an offer has a limited period of validity or is subject to conditions, this is expressly stated in the offer. The offer contains a complete and accurate description of the products and/or services offered. The description is sufficiently detailed to allow a good assessment of the offer by the consumer. If the entrepreneur uses images, these are a true representation of the products and/or services offered. Obvious mistakes or errors in the offer do not bind the entrepreneur. The minimum duration of the distance contract in the event of an agreement that extends to continuous or periodic delivery of products or services. The agreement shall be concluded, subject to the provisions of paragraph 4, at the time of acceptance by the consumer of the offer and the fulfilment of the conditions laid down. If the consumer has accepted the offer by electronic means, the trader shall immediately confirm receipt of acceptance of the offer by electronic means. As long as the receipt of such acceptance has not been confirmed, the consumer may rescind the agreement. If the contract is concluded electronically, the entrepreneur takes appropriate technical and organisational measures to secure the electronic transfer of data and ensures a safe web environment. If the consumer can pay electronically, the trader will take appropriate safety measures to that end. The trader can inform himself, within legal frameworks, whether the consumer can meet his payment obligations, as well as all the facts and factors that are important for a responsible engagement of the distance contract. If, on the basis of this investigation, the trader has good grounds for failing to enter into the agreement, he is entitled to refuse an order or application or to attach special conditions to the execution. If the trader has committed to supplying a range of products or services, the provision in the preceding paragraph shall apply only to the first delivery. When purchasing products, the consumer has the possibility to dissolve the contract without giving reasons for seven working days. This period starts on the day after receipt of the product by or on behalf of the consumer. During this period the consumer will handle the product and the packaging carefully. He will only extract or use the product to the extent necessary to be able to assess whether he wishes to retain the product. If he avails himself of his right of withdrawal, he shall return the product with all the accessories supplied and if reasonably possible-in its original condition and packaging to the trader, in accordance with the reasonable and Clear instructions. In the case of provision of services, the consumer has the possibility of dissolving the contract without giving reasons for seven working days, as from the date of the contract. In order to make use of his right of withdrawal, the consumer will focus on the reasonable and clear instructions provided by the trader in the offer and/or at the latest upon delivery. If the consumer makes use of his right of withdrawal, the costs of returning the goods shall be at most. If the consumer has paid an amount, the trader will reimburse this amount as soon as possible, but no later than 30 days after the return or revocation. If the consumer does not have a right of withdrawal, this can only be excluded by the trader if the entrepreneur has clearly stated this in the offer, at least in good time before the conclusion of the contract. g) for audio and video recordings and computer software, the consumer of which has broken the seal. c) on bets and lotteries. During the period of validity indicated in the offer, the prices of the products and/or services offered are not increased, subject to price changes due to changes in VAT? rates. Notwithstanding the previous paragraph, the trader may offer products or services whose prices are subject to fluctuations in the financial market and where the trader has no influence, with variable prices. This bonding to fluctuations and the fact that any prices quoted are indicative prices are indicated in the offer. Price increases within 3 months of the conclusion of the agreement are only permitted if they are the result of legal regulations or provisions. (b) The consumer has the power to terminate the contract by the day on which the price increase enters. The prices quoted in the offer of products or services include VAT. The trader insists that the products and/or services comply with the agreement, the specifications stated in the offer, the reasonable requirements of soundness and/or usability and the existing on the date of the conclusion of the agreement legal provisions and/or government regulations. An arrangement offered by the trader, manufacturer or importer as a guarantee does not diminish the rights and claims which the consumer can assert against the trader in respect of a shortcoming in the fulfilment of the obligations of the entrepreneur in respect of the entrepreneur Under the law and/or the distance contract. The entrepreneur will observe the utmost care when receiving and executing orders for products and in assessing applications for the provision of services. The place of delivery shall be the address which the consumer has made known to the company. In accordance with the provisions of article 4 of these general terms and conditions, the company will carry out accepted orders with due urgency but not later than 30 days unless a longer delivery date has been agreed. If the delivery is delayed, or if an order cannot be executed or only partially completed, the consumer will receive a notice no later than one month after placing the order. In that case, the consumer has the right to dissolve the contract without any costs and the right to compensation. In the event of dissolution in accordance with the preceding paragraph, the trader shall repay the amount paid by the consumer as soon as possible, but within 30 days of termination. If delivery of an ordered product proves to be impossible, the trader will endeavour to make a replacement item available. No later than delivery, a clear and comprehensible notification will be given that a replacement item is delivered. In the case of replacement items, the right of withdrawal cannot be excluded. The costs of return shipping are for the account of the entrepreneur. The risk of damage and/or loss of products is based on the consumers delivery to the trader, unless expressly agreed otherwise. Photos on the website are made by individual external photo graves No rights can be derived from this. Pictures are made from the actual plant. If the result differs from the photograph, we cannot be held liable for this. All rights are reserved for all information on our website. Photos are obtained by legal means through external channels in which the copyrights have been purchased. The entrepreneur is therefore not prosecuted by law due to copyright infringement possible data. The consumer may terminate an agreement which has been entered into for an indefinite period at any time with due observance of the termination rules agreed to that end and a notice period not exceeding one month. A contract that has entered into for a certain period of time has a maturity of up to two years. If it has been agreed that the consumers silence will extend the distance contract, the contract will be continued as an indefinite agreement and the notice period following the continuation of the Agreement shall be limited to one Month amounts. Unless agreed later, the amounts owed by the consumer must be paid within fourteen days of delivery of the property or in the event of an agreement to the provision of a service, within 14 days after the issue of the Agreement on documents. When selling products to consumers, in general terms and conditions, a prepayment of more than 50% may never be stipulated. Where advance payment is stipulated, the consumer shall not be entitled to assert any right in respect of the execution of the order or service (s) in question before the stipulated advance payment has been made. The consumer has a duty to notify the trader without delay of any inaccuracies in the payment information provided or stated. In the event of default of the consumer, the trader has, subject to legal restrictions, the right to charge the reasonable costs incurred in advance to the consumer. The entrepreneur has a sufficiently well-publicised complaints procedure and treats the complaint in accordance with this complaint procedure. Complaints about the implementation of the agreement must be submitted to the trader within a reasonable time, in full and clearly defined, after the consumer has found the defects. Complaints submitted to the trader shall be answered within a period of 14 days from the date of receipt. If a complaint requires a foreseeable longer processing time, the trader will reply within the 14-day period with a notice of receipt and an indication when the consumer can expect a more detailed answer. Plants remain a natural product, if you take care of them well, they will continue to flourish remarkably. Our effort is to provide you with the best possible product. 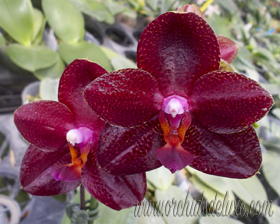 Orchidsdelux offers a payment number of payment options. In all cases, you will never leave bank information on our website. Only when you choose to use the MultiSafePay website. Orchidsdelux has made this choice to provide maximum security and as little as possible of your data in our database..